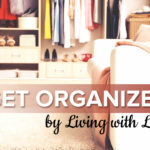 The following is a post from contributing writer Jackie. I was recently given some hand-me-down clothes for my children which were such a blessing. However, there were a few T-shirts from ball teams or events my children didn’t participate in. I wasn’t about to throw them out but I also wasn’t sure my kids would want to wear them either. That is when inspiration struck. While looking at one of the T-shirts, I decided it would make a perfect skirt for my baby girl. 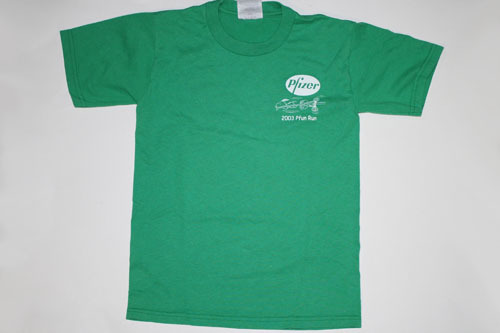 T-shirts are a great source of knit fabric. Knit clothing is so comfortable and low maintenance which makes knit fabric an ideal choice for children. Here’s the most awesome part about making a skirt from a T-shirt. No hemming! 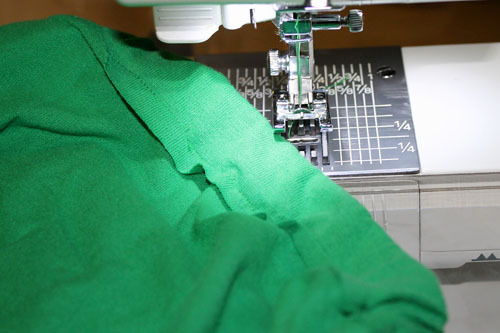 You can use the hem from the T-shirt so there is literally only one seam to sew. 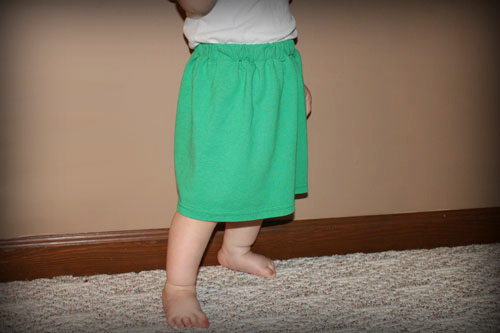 This makes for a very quick and simple skirt that literally takes 15 minutes to make. The T-shirt I chose was a child’s size 6-8. There was plenty of fabric to make a skirt and headband for my 14 month old daughter who wears size 18 months clothes. 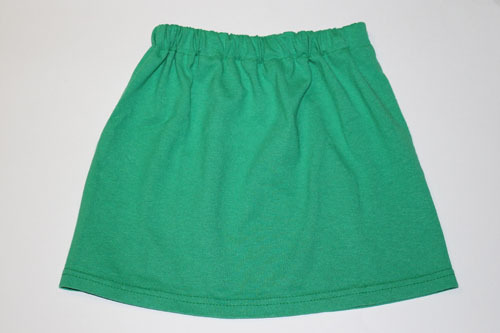 To make this skirt for other sizes of children, or even adults, you will need to choose a T-shirt that is appropriately sized. There needs to be enough length for your skirt from just below the sleeves of the T-shirt to the hem, minus 1 1/4 inches (elastic casing width). 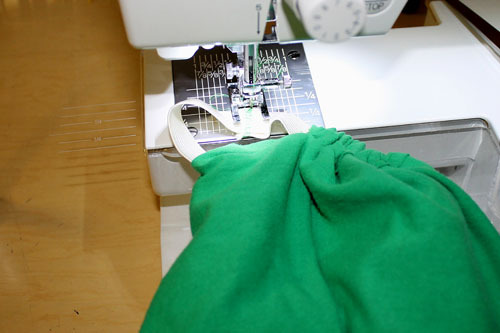 Do you want to know how to make a shirt skirt? Let’s get sewing! 1. Cut the T-shirt just below the sleeves cutting through both layers at the same time. For my daughter, who wears size 18 months, the length of the T-shirt from below the logo to the hem was 12 inches which was perfect. 2. Turn the tube of fabric wrong side out. Fold over 1 1/4 inches at the top (cut edge) and pin in place. This will become your skirt’s waistband. 3. To make a casing for the elastic, sew around the skirt with your presser foot along the cut edge of the fabric. Be sure to leave a 2 inch opening for threading the elastic through. 4. 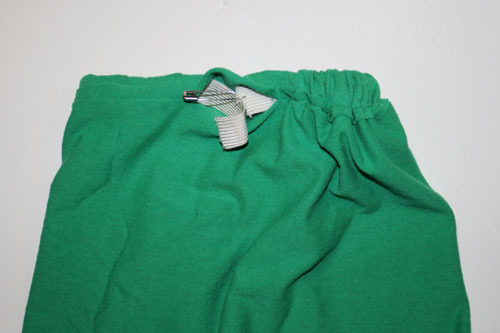 Attach a safety pin to one end of the elastic and thread it through the opening. Try on the skirt at this point to see how much elastic you need. For my daughter I needed 17 inches of 3/4 inch elastic. Adjust the elastic to make sure that it is not twisted before moving on to Step 5. 5. Sew over the two ends of the elastic at the point where the skirt fits well. Use a zig-zag stitch and stitch back and forth 3 or 4 times. 6. 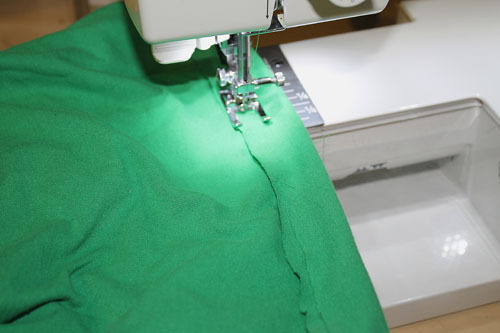 Sew the opening of the skirt closed by matching the seam you stitched in Step 3. That is all there is to making a simple skirt with an elastic waistband. 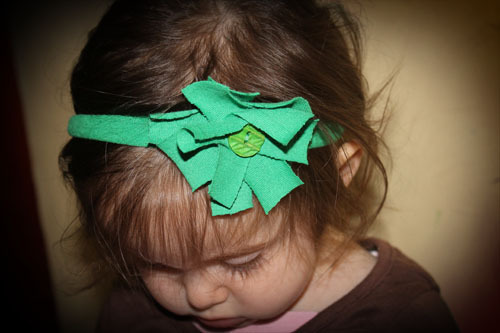 Now that you know how to make one, I bet you will be making them in all sorts of colors and sizes. Like I mentioned earlier, the bigger the T-shirt the bigger the skirt you can make. Since I still had the top part of the T-shirt left, I thought it would be fun to make a headband for my daughter to match her new skirt. What I designed is very simple to make, will fit a wide range of sizes, and has that shabby chic look that is so popular. 1. 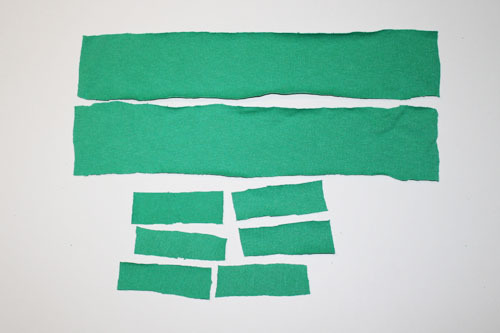 Cut 2 pieces of T-shirt fabric that are 12 inches by 2 inches and 6 pieces that are 3 inches by 1 inch. 2. Sew the two 12 inch pieces of fabric together (right sides together) at one set of short ends using a 1/4 inch seam allowance. 3. 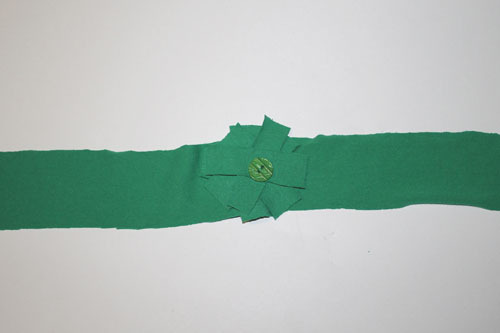 Layer the 3 inch pieces of fabric on the seam of the long fabric strip in criss-cross fashion. Lay a coordinating button on top. 4. 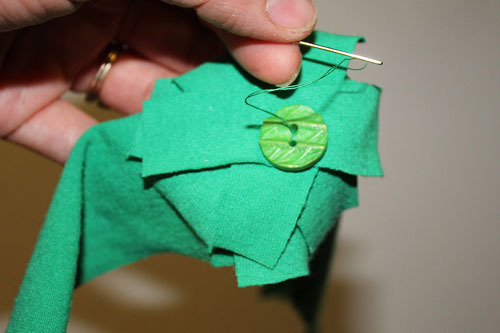 Using a needle and thread sew all of the layers of fabric and the button right in the center. Make sure all of the layers and the button are very secure. 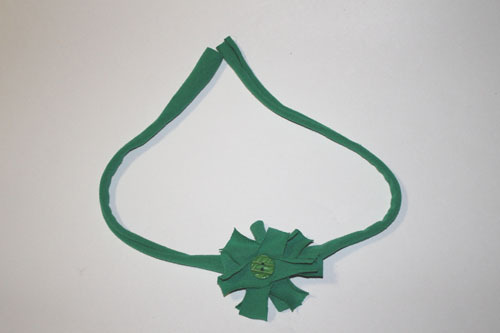 Here is what the headband will look like from the back side. 5. 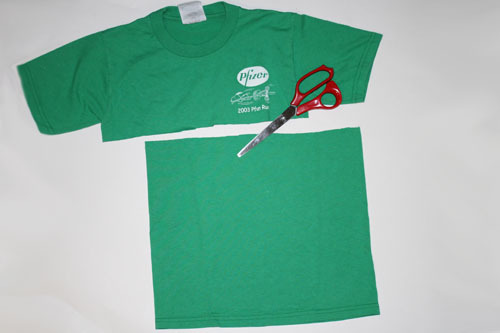 Next, you need to stretch the T-shirt fabric strips. Stretch them until they start to curl inward. 6. 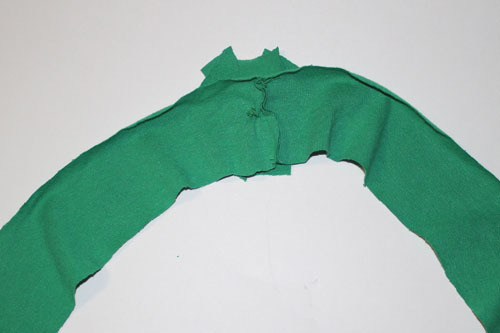 Tie the headband around your head (or whoever is going to wear it) and either cut the excess fabric or leave it. Either way is fine. I cut the fabric tails so my baby could wear the headband. The skirt and headband were so much fun to make. I think I see lots more in my daughter’s (and my older daughter’s) future. 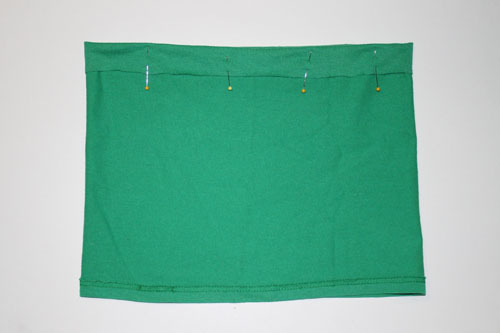 Do you have any T-shirts lying around you could use to make a skirt and/or headband? Great ideas! I love the skirt and will have to try making this when my craft area is put back together after the renovation is complete! These are great instructions! 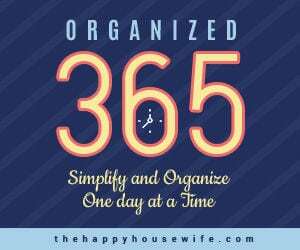 I will be featuring this article for my Saturday Project this week! I have been wanting to try a tee-shirt skirt for a while. Thanks!! Awesome project. Definitely going to upcycle a few shirts for the little one. I have done this also. One of my favorite skirts I made my daughter was made from a men’s polo shirt and I made it the same way. If my daughter didn’t get such long legs she could still wear it but alas they grow too quickly. I have some more tees awaiting their transformation on top of my dresser even now. It is so nice not to have to sew all those seams and hem.